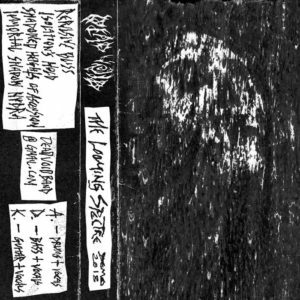 From their Bandcamp page, Death Void states “Recorded (mostly live) in October 2017. Cassette release will be available to order after we return from The Abyss Underground Festival.” It is as if we caught this band going out of the door and had little time for us being in their place. Add to this a photocopied demo and one wonders if we should just come back in a few months. This nonchalance regarding their demo only serves to heighten interest as The Looming Spectre, while not a perfect demo, is more than fun to listen to with a band that seems to have tons of potential hidden away under a cool visage. As the rule with demos goes, one could be getting a 4 minute or 70 minute release. The Looming Spectre falls somewhere between with 33 minutes being dedicated across 4 tracks of rotten death / doom or just slow moving death. As far as sound goes, this is music that works as low fidelity as it would with better production since there is a thesis under these corpses and it is one of existential obliteration. This is music to dance to if dancing mean wearing your ankles down to the nub. One of the band’s promo pictures has the tag line of “non ritualistic death metal” and since this band is the only one using that tag, I can only assume it is a step away from occult black / death to something more primal and ultimately festering. One may think there is not much separating Death Void from the likes of bands like Temple Nightside and QRIXKUOR but in the world of death metal, Dead Void is far beyond civilization hidden under the stench of verdant decay.